Wanna be the hostess with the mostess? 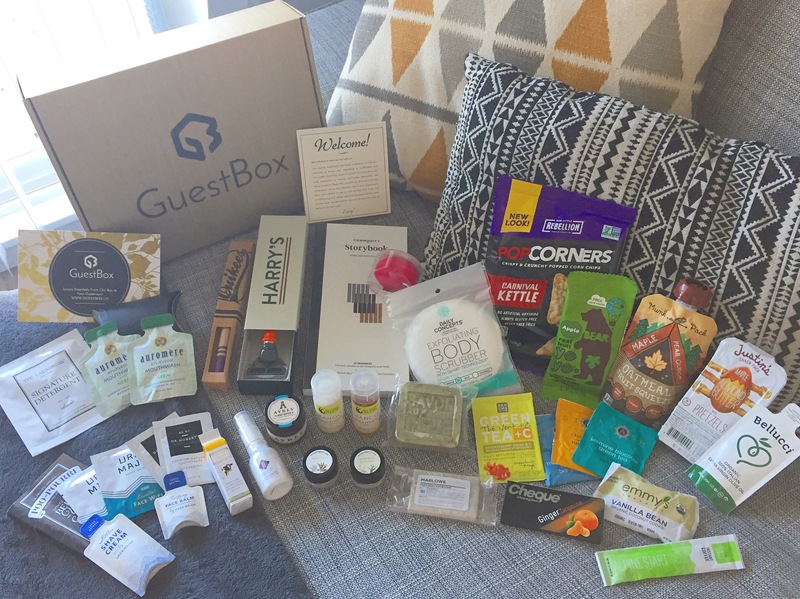 Okay the GuestBox is simply awesome, and jam packed! Participate in AirBnB? VRBO? Pretty much any type of vacation rental or just want to be an amazing host and make that spare bedroom the most welcoming. Going on vacation? I would order this and take all the bits and pieces with you rather than going out and buying them all individually! Or put it out for your guests, you are guaranteed a great review if you do! This is even a great gift box, perfect for the new move, friend that’s staying for the weekend, the options are endless! This has got to be one of my favourite boxes. They have quantity and quality for sure with a box jam packed with over 20 items! The Guest Box sends you all the essentials you could dream of that you would need will hosting or travelling. With bathroom essentials like toothbrush and toothpaste, to body care like shave cream and lotion, to snacks like oat bars and almond butter, coffee and tea, and everything else in between. They have you covered in case you forget a thing! They also have tons of coupon codes for all the items included so if you fancied it, you can order more! Poo-Pourri – a godsend. If you haven’t tried this then your insane. Just saying. I live by poo-pourri and am impressed they remembered to add this in the box. Not sure what it is? Watch the YouTube video to enlighten yourself! Ayres – body butter from Buenos Aires with notes of jasmine and rosemary. The Laundress – detergent for on the go. Commodity – a storybook of 15 different fragrances! Holy smokes! With a Platinum, Black & White collection you have fragrances ranging from Leather to Mimosa! Harry’s ravor – a high quality razor engineered in Germany. Quikees bamboo toothbrush – soft to the touch and looks like a crayon! Love bamboo toothbrushes. Auromere mouthwash – x2 a vegan mouthwash made with 23 botanical extracts and 9 essential oils. Key West Aloes – shampoo and conditioner made with real aloe and yummy smelling mango! Daily Concepts exfoliating body scrubber – love this for on the go or at home! Ursa Major’s – face wipes, balm and shave cream for on the go made with natural ingredients and no toxins. Annmarie Gianni’s – aloe herb cleanser and sunlpve sunscreen in little to go bottles. Foreo’s luna play face cleanser – reusable silicone cleaner! June Jacobs – love this hydrating mist! MooGoos – little lip balm of course! Tingling honey lip balm to be exact! Stash tea – 3 bags of it! Justin’s maple almond butter – yum! Alpine starts instant coffee – perfect for on the go quick coffee! Munk pack – looooove these! Oatmeal squeeze pack to go! Emmy’s organics – love these macaroons!